From Jansson's Atlas Novus series of Atlases volume IV Great Britain & Ireland, Dutch edition. As with most maps of Great Britain and Ireland Jansson relied heavily on the Blaeu firm for his information. 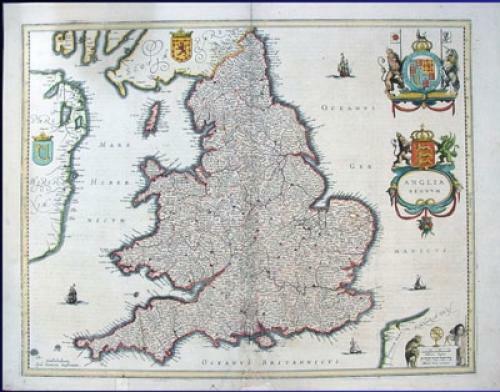 Two items that separate this map from the Blaeu version is the Jansson signature and the Irish Coat of Arms located in the middle of Ireland. A well engraved map with a wealth of detail of Stuart England. The map has undergone two repairs, with some small loss, to the bottom centerfold and another small repair to Norfolk. Reinforced along the centerfold on verso.